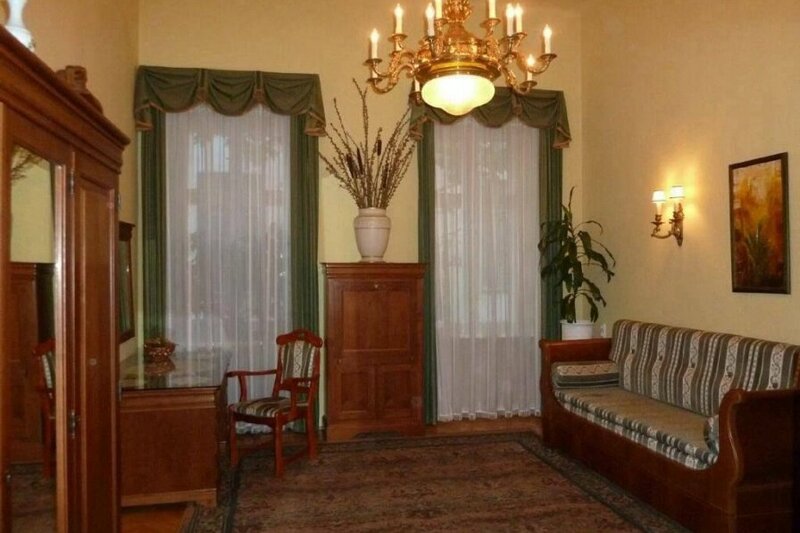 This very attractive luxuriously stylish apartment is in the heart of Budapest. It's just a few steps away from the famous Oktogon Square. It is perfect for families and groups of friends. The apartment is on the first floor of a historic listed building and is 89 square meter. You reach the apartment through a beautiful courtyard. The courtyard is a wonderful place to enjoy perfect tranquility and fresh air. It has an authentic Hungarian atmosphere. The apartment is tastefully furnished with some typical Hungarian old style solid oak furniture. You'll find an attractive, genuine earthenware stove in the living room and in one of the bedrooms, which was handmade specifically for this place. The apartment is in an ideal position for exploring this wonderful city. Many famous sights are within walking distance. These include the Opera House, Liberty Square 'Szabdsag ter' and the Budapest Parliament, the famous walking street the „Váci utca" the Vörösmarty Square, the Heroes Square, the City Park, the Széchenyi Baths, /with the underground train, the Margaret Island, the largest Shopping Center in Europe the River Danube, which flows across the city, and separates the Buda side from Pest side, and from where thousands of pleasure cruises sail away to their journeys. The residential area includes two rooms with double beds, and one room with a triple beds, which are furnished in accordance of a luxury suites, with all modern conveniences / Internet, bathroom, kitchen, toilet/. In each room there is a television with multiple channel broadcast. Of course, all this is at a reasonable price, compared to those hotels, in the downtown, which might cost an absolute fortune. I think I have to mention, that all these services give you a familiar atmosphere, where you will feel at home. It is advantageous, because it is well located and from this point of view is within easy reach of most of the sights of Budapest. The entire apartment can be booked by up to 6 people. Let us know if You have any questions. WE are here for our guests to make you as comfortable as possible. Street parking and Parking House nearby as well.